First off you can hear my near death mountain story. I know I always encourage persistence to live your life, unlimited but sometimes you have to know when to quit and this was one of those times. 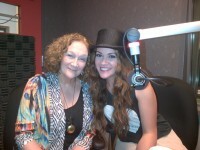 And I love, love , love talking to and learning from, the wise young recording artist, Sierra Noble. Stephanie Staples, CSP* is the author of When Enlightening Strikes – Creating a Mindset for Uncommon Success and an internationally acclaimed motivational speaker. She empowers audiences & clients across North America to bring their ‘A’ game to work and to life. Stephanie has a special interest in working with and empowering nurses and healthcare providers. She happily calls Winnipeg, Manitoba, Canada home. You can get loads of complimentary resources to help with issues such as work/life balance, wellness, stress management and happiness in general, as well as find out more information about her coaching and speaking services at http://www.YourLifeUnlimited.ca. This entry was posted in Blog and tagged cjob, empowerment, Inspiration, podcast. Bookmark the permalink. Previous Previous post: Idea’s Galore! Next Next post: Is your significant relationship strong (enough)?